Given that Asia dominates the list of 100 Fastest Internet cities and China is the most populous nation in the world, it shouldn’t come as a surprise to anyone that China is home to the largest broadband service provider in the world. The latest data gathered by Telegeography, a research firm, shows that at the end of the first quarter of 2010, China Telecom led the top 10 broadband service providers rankings. It was followed by China Unicom. The rise of these two carriers also mirrors the rise of China as an Internet behemoth, pushing the U.S. into the second spot. ?The United States had four broadband ISPs in the top ten list: Comcast (s CMSCA), AT&T (s T), Time Warner Cable (c TWC) and Verizon (s VZ). ?Korea Telecom cracked the top 10 and edged out Telecom Italia, pushing it to the No. 11 spot. These top 10 broadband service providers in total account for roughly 39 percent of world’s total broadband customers, and they collectively added about 23.3 million new subscribers between the first quarter of 2009 and the first quarter of 2010. Who’s The Best Performing ISP? While sheer size and scope matters, it’s also important to check out a service provider’s actual performance. Many ISPs make wild bandwidth and speed claims, but deliver a suboptimal performance from their broadband connections. Ookla, the Seattle, Wash.-based company behind the popular Speedtest.net web service, has developed a new methodology (announced yesterday) that shows you the actual performance of broadband service providers from an end-user’s perspective. “The new ISP ranking data takes a giant step in that direction, further empowering consumers for the first time with rich data that helps evaluate ISP performance close to home or throughout the world,” ?Ookla co-founder Mike Apgar said in a statement. 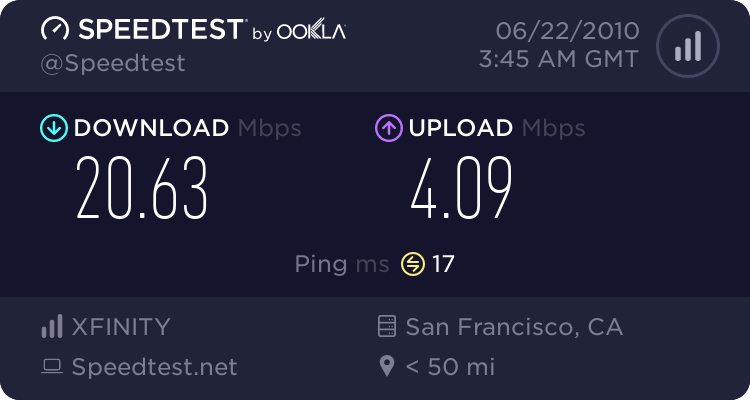 With nearly a million speed tests a day, Ookla has a good idea about which ISPs are performing well and are true to their claims. According to Ookla, U.S. ISPs deliver an average download speed of 9.9 Mbps while Chinese ISPs deliver an average download speed of 3.5 Mbps. South Korean download speeds, meanwhile, are around 31.5 Mbps. How do U.S. broadband service providers rank? Ookla says Comcast is the best broadband provider in download speed terms, with an average download speed of 16.26 Mbps, while Time Warner Cable has an average speed of 13.48 Mbps and Verizon has an average of 10.76 Mbps. Here are the top ten broadband service providers in the US based on download speeds. 5. RoadRunner (Time Warner Cable) 13.48 Mbps. 10. Prairiewave Telecommunications 10.52 Mbps. You can see clearly that cable companies dominate this list. Related Research Report from GigaOM Pro: The Internet of Things: Anywhere, Anytime, Anything. Buy for $199 now. According to Ookla, in the U.S., the average monthly cost for broadband is at $47.32 or about $5.06 per megabit per second. In California, broadband costs just $4.24 per Mbps, while residents of Idaho pay $8.80 per Mbps, Washington respondents averaged just $3.89 per Mbps and Michigan subscribers pay $6.36. Hello, I do internet technical support for the ISP Insight Communications. Your list appears to be outdated. We currently offer residential broadband speeds for 10Mbps & 20Mbps. Also 30Mbps & 50Mbps connections coming next month. Our 10meg connection is our basic service. Is this further proof of the stigma associated with all products made in China that they are indeed not up to the quality we in the west have coem to expect? It just might be that they are simply scaling up right now and in time would get to a point where China too will have higher quality/speed of broadband. What’s phenomenal about the Worlds Top 10 Broadband ISP’s is that they are all share the same telecom equipment provider and that is the behemoth, ZTE, based in China. It’s hard to get anything competitive done in the telecom or broadband arena without including ZTE or Huawei. 15 Mbps download in Marin County? Is that what I’m missing out on in West Marin? Damn. The continuous agony of the last mile. Have you tried Sonic.net? I hear they are pretty awesome. I guess the correct web address is speedtest.net for Ookla’s popular web servide. Sorry about that. I had fixed it while you were leaving this comment. Your vigilance is appreciated. Hi Om, minor correction above… Ookla runs http://speedtest.net, .com looks to be parked on by some domain squatter. Oops. I just fixed it. thanks for helping out with the correct note.